In God, as Father and Creator of the Universe; in Jesus Christ, the Son of God, whom God and this Jesus was born of a virgin by the power of the Spirit of God; we believe that Jesus was crucified on the cross and that He willingly gave his life, was buried, rose again, and will return visibly to the world; we believe that man is born in sin, needs the work of the Holy Spirit in regeneration; we believe that there is a continual sanctification work with keeps one clean and separate to God for spiritual service; we believe that the gift of the Holy Spirit is for people today and that "speaking in tongues" is valid, but must be used wisely in church edification and privately in personal edification; we believe in signs, wonders, miracles and healings of mind, spirit, and body; and we believe that the Bible reveals the plan of salvation and that the Scriptures were written down by different men, in different localities,in different times, but all inspired by the same God; we believe in the Bible, both Old and New Testaments; we believe the Bible is inerrant. The Christ Holy Sanctified Church was first established in Keatchie, Louisiana in 1910 under the lordship of Jesus Christ, as given to His servants, the late Bishop Judge and Sarah King. Sometime after World War I (c. 1918), Bishop Judge King and his family moved to Los Angeles, California, in search of a better life for his family because of racial prejudice in the South. Traveling from city-to-city, along the way, they preached in open fields and under brush arbors while planting spiritual seed for a future harvest. After arriving in Los Angeles, Judge and Sarah quickly made many new friends and acquaintances. At that time there were no Christ Holy Sanctified Churches in Los Angeles, or in the entire state. However, word quickly spread about this young gifted and anointed couple, and church doors were opened to them across denominational lines to worship, fellowship, and to preach the gospel. In the early 1920s, Bishop King moved north to Oroville, California to work in the sawmills, and there he opened a small mission church. He came to the area preaching "holiness and sanctification" which many believed was an extremist religious teaching. Others believed the saints to be fanatics given to emotionalism and practiced voodoo. Because of strong racial and religious prejudice in that area he was forced to move his family out of harms way to Central California. Before leaving Oroville, a mob of religious zealots who scorned and felt nothing but contempt towards Pentecostalism, burned the church down. He and several saints were beaten and thrown in jail because of racial intolerance and religious prejudice. Not only did the teachings of holiness and sanctification disturb some but the idea of whites and blacks worshiping together were unconscionable. One evening during service, a crazed assailant entered the church and shot Sarah King in the arm while she was singing and preaching the Word of God. The gospel of the kingdom did not come easily to this area. After arriving in Central California they regained strength and encouragement from saints and friends who took them into their homes. Bishop King's popularity and powerful message of holiness and sanctification grew and had spread rapidly throughout California. Not long after making his way to the Bay Area, and new home in San Francisco, it was in 1925 that he heard the voice of the Lord instructing him to "move out," and sent him to establish a mission church, across the bay, in West Oakland. 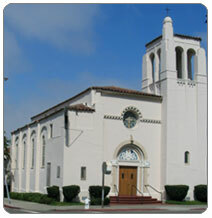 The first Christ Holy Sanctified Church in Oakland was located in a two-story house on Seventh Street. Seventh Street was culturally rich, diverse, and had a colorful social nightlife. During the post-war years, nearly a half-mile area along Seventh Street was known as "hell's half acre." It was called this because of seedy nightclubs, prostitution, derelicts, street alcoholics, and sometimes open street violence. It was one of the Bay Area's well-known nightlife attractions. People from all over the Bay Area--black and white--and visitors from other parts of the country and world would frequent many of the popular nightclubs and bars. Many great jazz musicians and blues singers are said to have made their beginning on Seventh Street in West Oakland. The Seventh Street Mission, as it was known, was located in the center of this cultural Mecca. Under the leadership and direction of the Holy Spirit, Bishop Judge and Sarah King preached and led hundreds of souls to Christ. They preached on street corners, in front of bars, and invited people into their homes. Pimps, prostitutes, and drunken sailors all heard and believed the gospel of Jesus Christ. Miracles, signs and wonders followed their ministry and the church grew rapidly into one of the great centers of evangelism in the classical Pentecostal tradition in the Bay Area. Popular revivalist and evangelist throughout the country came to conduct revival services at the church. The congregation later moved to a larger building at 1711-7th Street. Bishop Judge King died in 1945, leaving the church in the hands of his son and able assistant, Bishop Ulysses S. King, Sr. Bishop King was a progressive thinker, spiritual leader, church administrator, organizer, and an anointed preacher and musician. He saw the church in a much larger context within the Christian community. He had great zeal and vision for the church. He believed the doctrine of holiness and sanctification could be taught in other communities of faiths without fear or prejudice. So he became a member of the Center for Urban Black Studies in Berkeley, California, and later received an Honorary Doctor of Divinity degree from the same institution. He was also a member of the Interdenominational Ministerial Alliance, and other community organizations. His vision was to see the local church become a center of influence within the heart of the community. However, in 1960, the U. S. Postal Service purchased several blocks of land and property on Seventh Street to build their new Main Post Office. The Seventh Street Mission had to find a new home. Bishop King, Mother M. K. Williams, and Deacon Tommy Thomas looked at several church buildings that were for sale throughout Oakland. After much prayer and discussion together, the Holy Spirit directed them to North Oakland. There they found and purchased a building from the Evangelical & Reformed Church, our present church home. For over sixty years in the ministry, Bishop Ulysses King, preached and served the church, and the people of God, everywhere. He took the message of salvation to Lagos and Uyo, Nigeria West Africa in 1972. Later a church was established in Uyo, Nigeria, May 12, 1976. Bishop King traveled across the United States preaching wherever a door was open to him. It did not matter whether the church was Pentecostal, Baptist, Methodist, a mainline denominational church, or a non-denominational church. If you had an ear to hear the Word of God, he would gladly preach to you. On July 5, 1985, Bishop Ulysses S. King, Sr. was called home to be with the Lord. His vision for the church, thankfully, continues and lives on. Because of the faithful leadership of our church Fathers, Memorial Tabernacle Church has emerged as an influential center of Christian outreach in our city, denomination, and Christian community at large. We give praise to God for where we have come and look forward to where He will lead us still. Copyright © Memorial Tabernacle Church CHSC. All Rights Reserved.